These photos of South Dakota's Black Hills were taken July 23-24, 2006. Includes photos from Lead, Keystone, Iron Mountain Road, Custer State Park, and the Needles Highway. 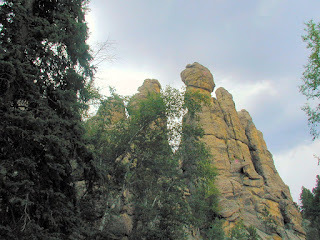 These are photos from the area around Mount Rushmore, South Dakota that we explored on our visit to Mt Rushmore. Our first stop on the way to the National Memorial was a very cool old mining town named "Lead" (don't be mis-"lead", they mined gold here.) The town is famous for the Homestake Gold Mine, the largest gold mine in the USA. The mine closed in 2002. 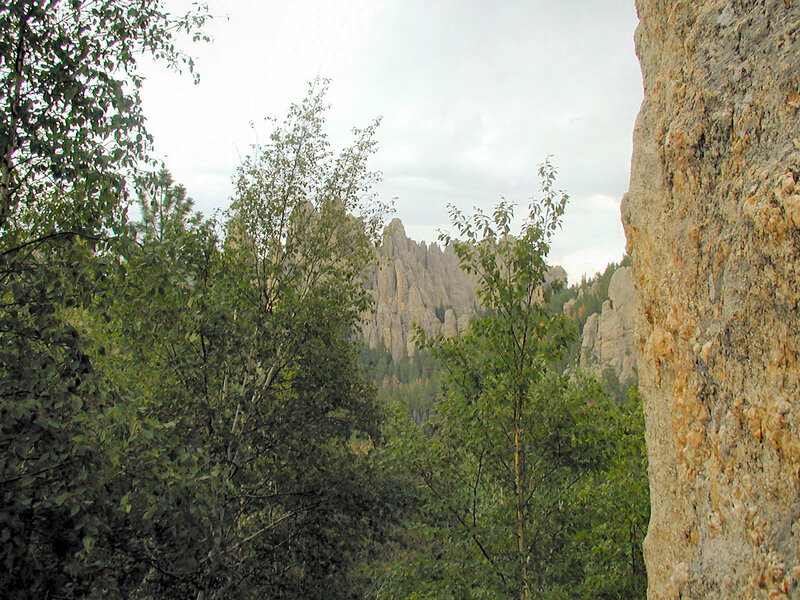 This photo was taken at a park at the site of the former Homestake Mine, in the town of Lead, South Dakota. 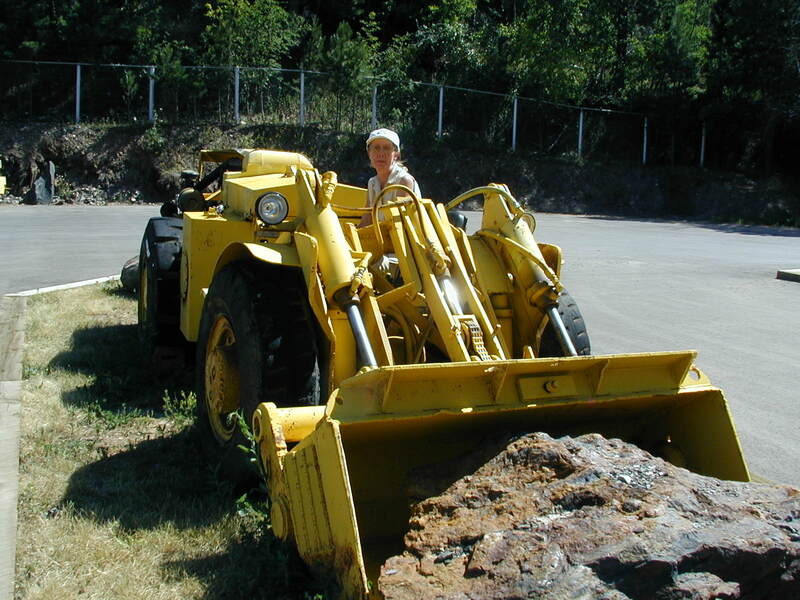 The park gives a self-guided interpretive history of the mine, along with lots of old mine equipment to check out. Julie's in the driver's seat of a loader. As a landscape architect I recommend this park for a visit. It is a very good example of adaptive reuse of a property and good park design. Lots of parking, rest rooms, interactive props (as you can see from the photos) good clear signage, and a logical order of progression through the interpretive exhibits. Worth the time to visit! 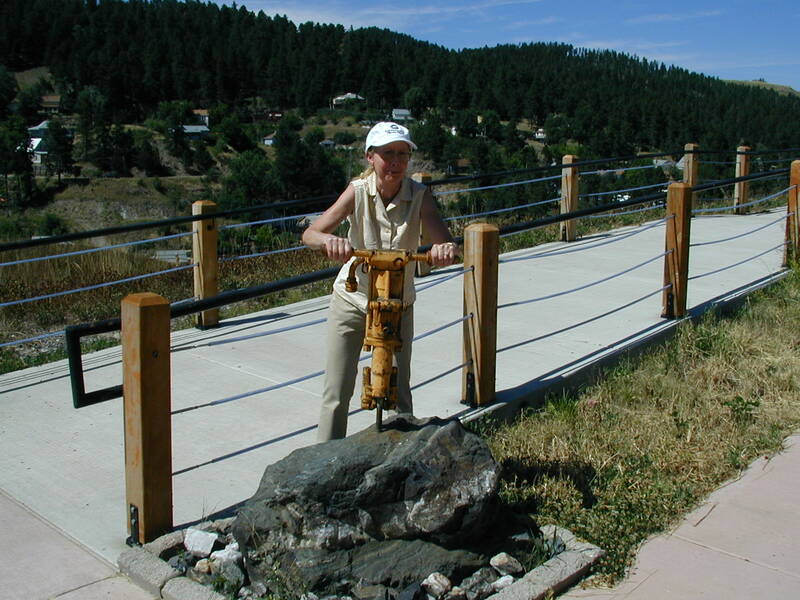 Julie demonstrates the use of a rock hammer drill. 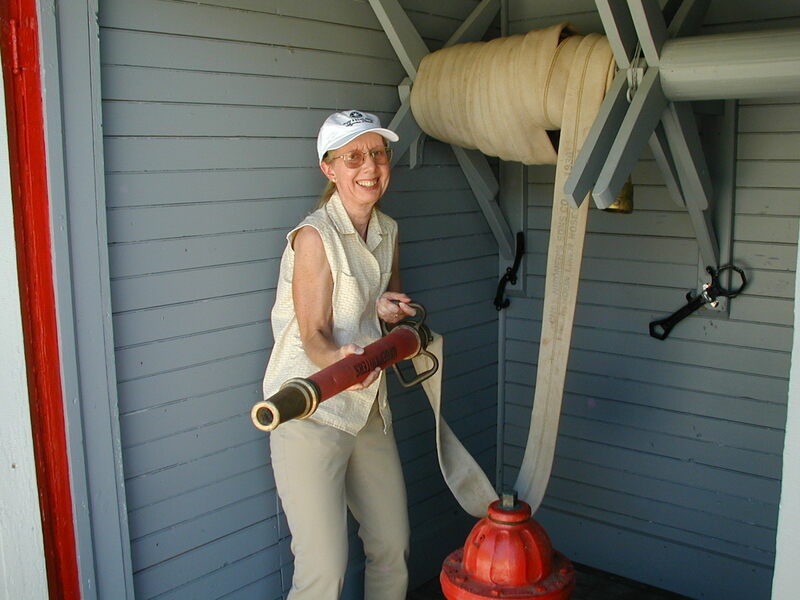 Fire in a mine can be a real disaster, so a well trained fire fighting crew is needed. After goofing around at the old mine in Lead, we continued on to the town of Keystone, South Dakota where we stayed the night. Keystone is a nice little town that is "touristy" but isn't a total tourist trap-- unlike some other towns adjacent famous National Park sites. 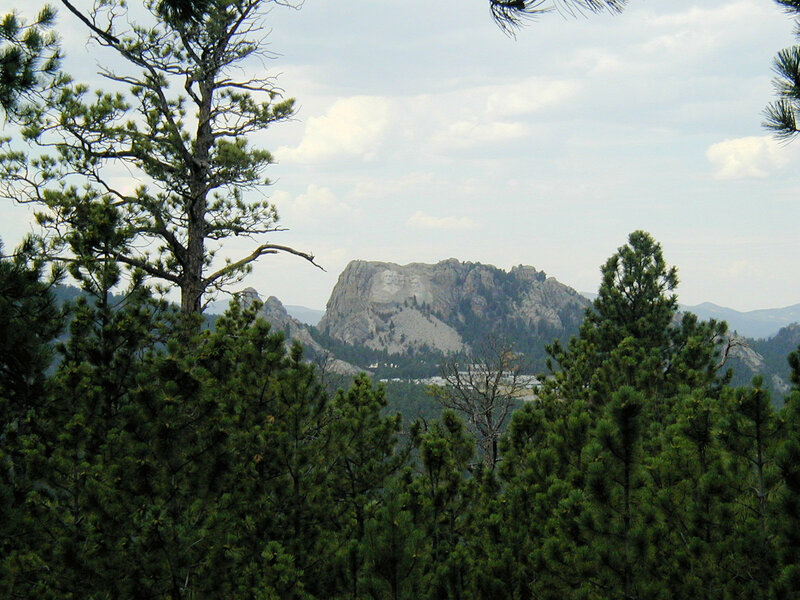 Mount Rushmore is just outside of the town of Keystone. 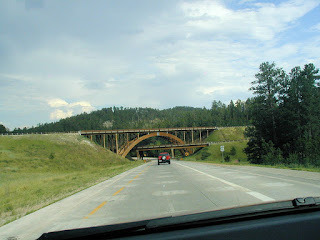 A cool-looking bridge at the intersection of state route 16 and Iron Mountain Road (16A) north of Keystone, SD. 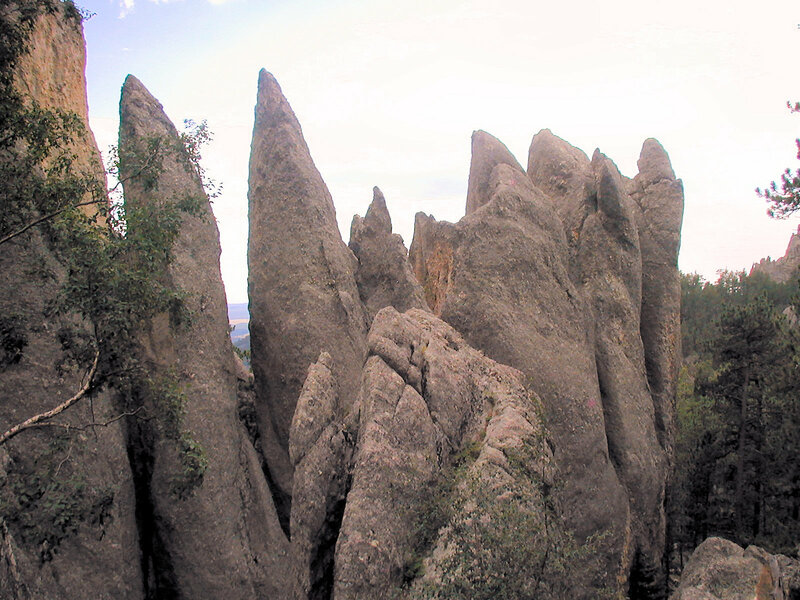 Iron Mountain Road (state route 16A) is a scenic roadway. 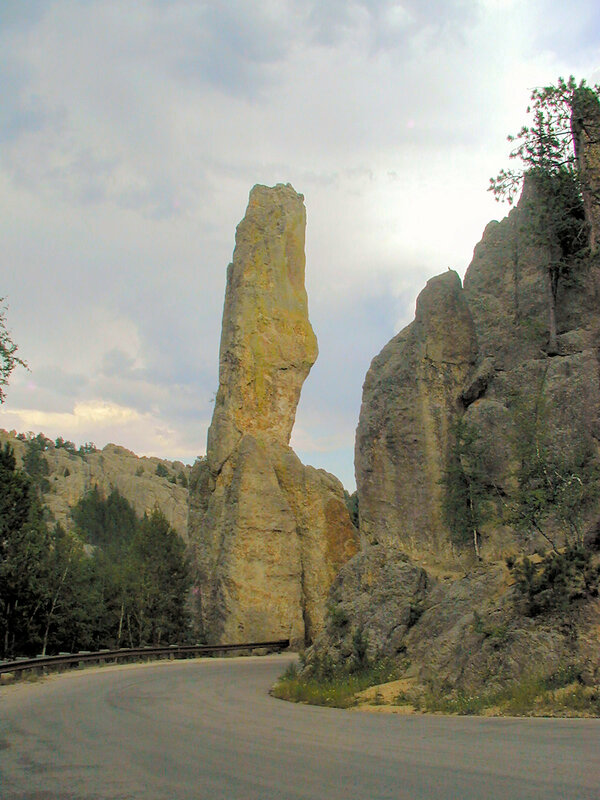 The best section of this road is located south of Keystone and just east of Mount Rushmore National Memorial. The road is famous for it's views, horseshoe curves, and the two places it makes 360 degree turns- where the road completely circles around and passes over itself as it climbs the side of the mountain! The other feature of the road are two narrow one-lane tunnels on the north side of Iron Mountain that are aligned with views of the Mount Rushmore National Memorial. One tunnel is aligned to give a view of Mt. Rushmore for the uphill traffic, the other is aligned for the downhill traffic. A third tunnel is on the far side of the mountain. There are also good views from the Norbeck Overlook at the top of the mountain. The road is definitely worth your time. 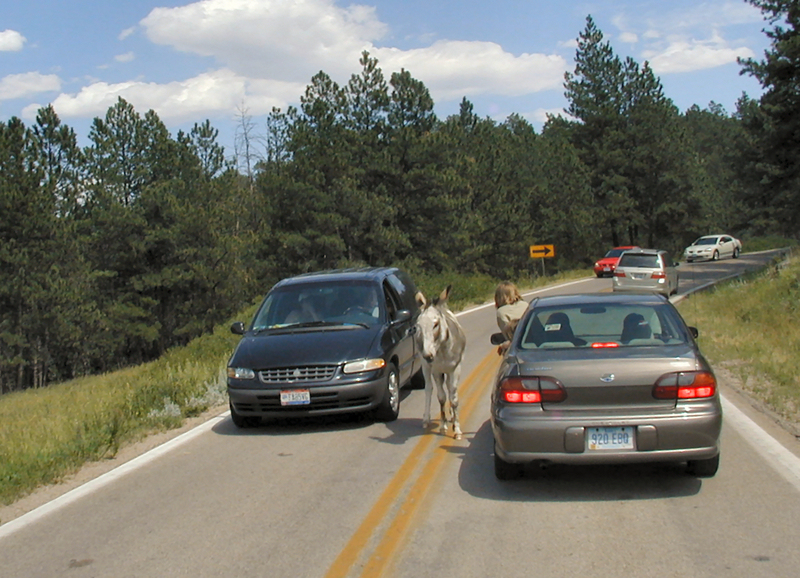 The Iron Mountain Road ends at Custer State Park and there is a use fee if you continue into the park. For the best views you need to go over the road one direction and then turn around and return. 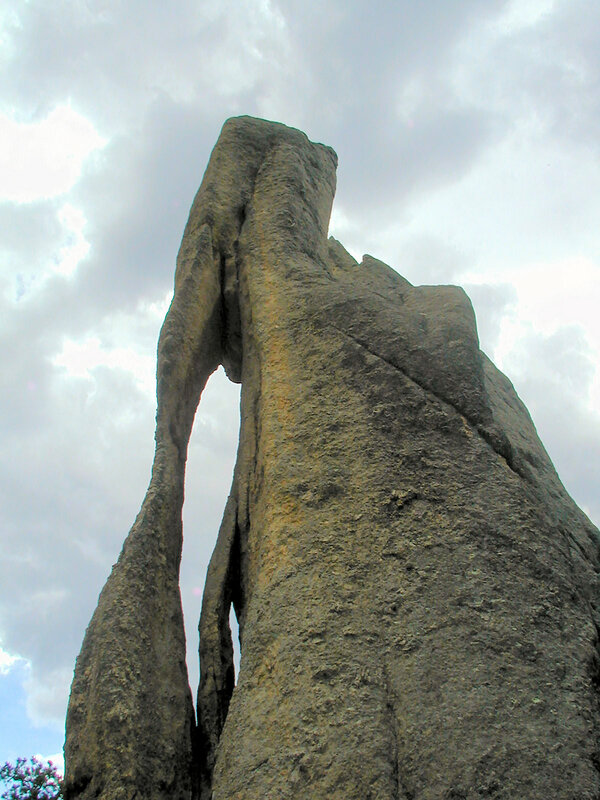 There are different views of Mount Rushmore in each direction. Distant view of Mt. Rushmore taken from the Iron Mountain Road. 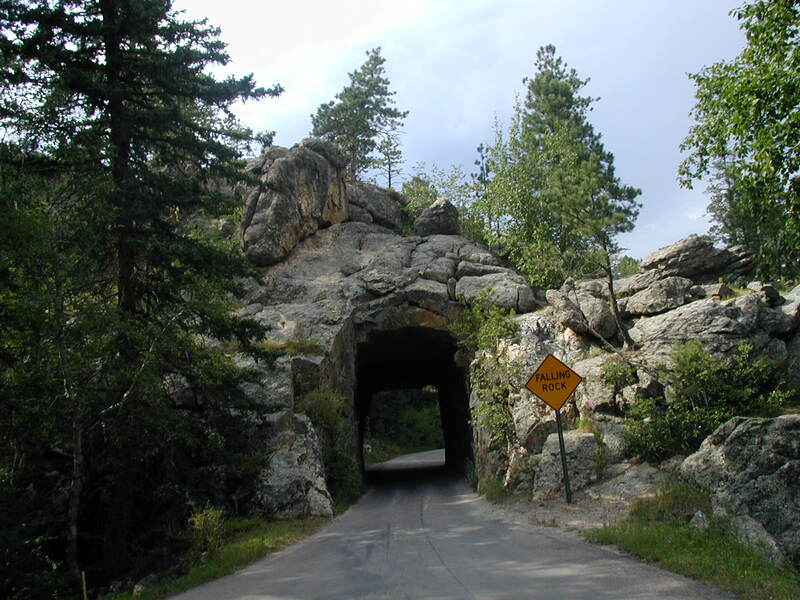 Tunnel on Iron Mountain Road. The road is wet in this photo because a thunderstorm came through while we were on the mountain. 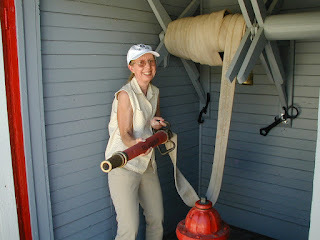 This photo and the next one are taken from the video below. Exiting the tunnel above. Note Mt. Rushmore in the distance is framed by the tunnel. Driving Iron Mountain Road - The video starts with a drive through the tunnel in the photos above. Watch for Mt. 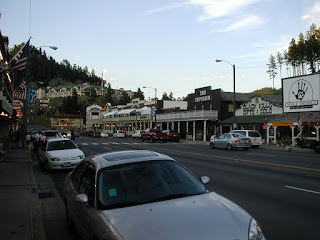 Rushmore in the distance as you exit the tunnel at the start of the video. 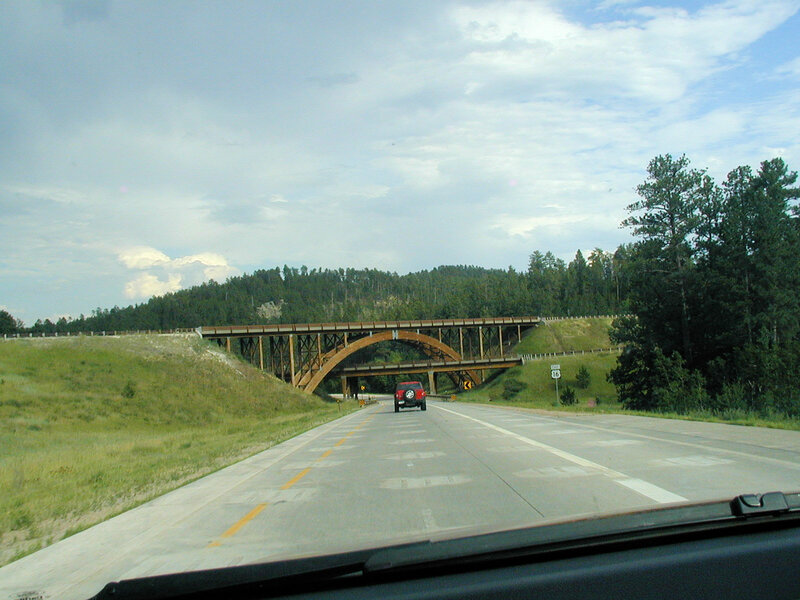 The road then continues downhill, through a sharp horseshoe curve, then down the steep hillside to one of the famous "Pigtail Bridges", which create a 360 degree over/under loop of the roadway. At the pigtail our car passes over a curving bridge then circles sharply to the left making a complete loop and passing under the bridge we just drove over. If you look on the right side at the start of the loop bridge you can see the road below going under the bridge. This was one of my first attempts at shooting a video. Keep in mind it was recorded in 2006, HD was not yet a thing for most of us! It had been raining, but there was a brief break in the rain so Julie held the camera up through the sunroof of our rental car and recorded this video as I drove back down the road. 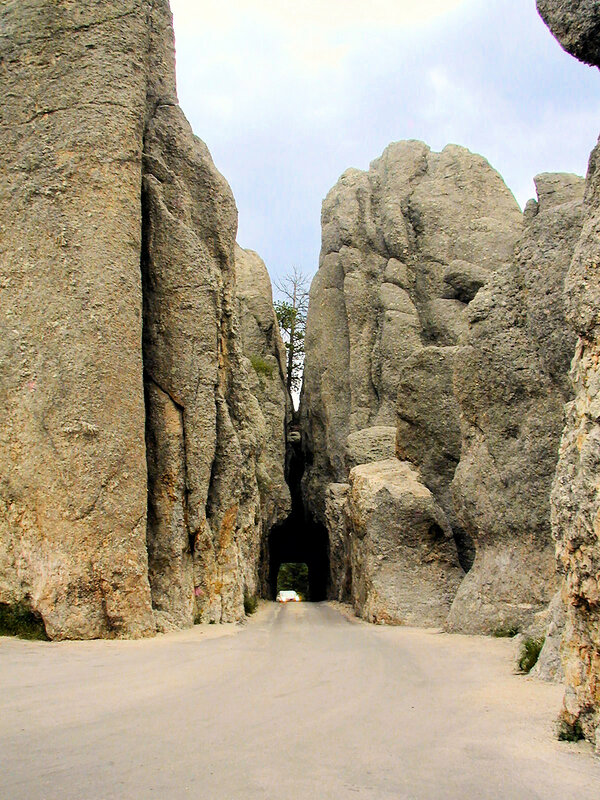 Custer State Park is located south of Mount Rushmore in the Black Hills. 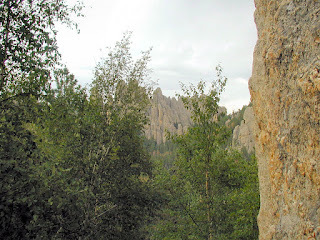 We drove over Iron Mountain Road into the park, then looped through the park on the Peter Norbeck Memorial Scenic Byway to Highway 97, The Needles Highway Scenic Drive. The drive is worth the State Park entrance fee. Custer State Park is known for the wild burros that beg for treats from passing cars. The State Game Lodge, a historic hotel in Custer State Park, South Dakota. If I had realized it was here when I was booking the trip I would have tried to get a room, since I love these old historic hotels. The staff was very gracious and allowed us to look around the hotel, even though we weren't guests. 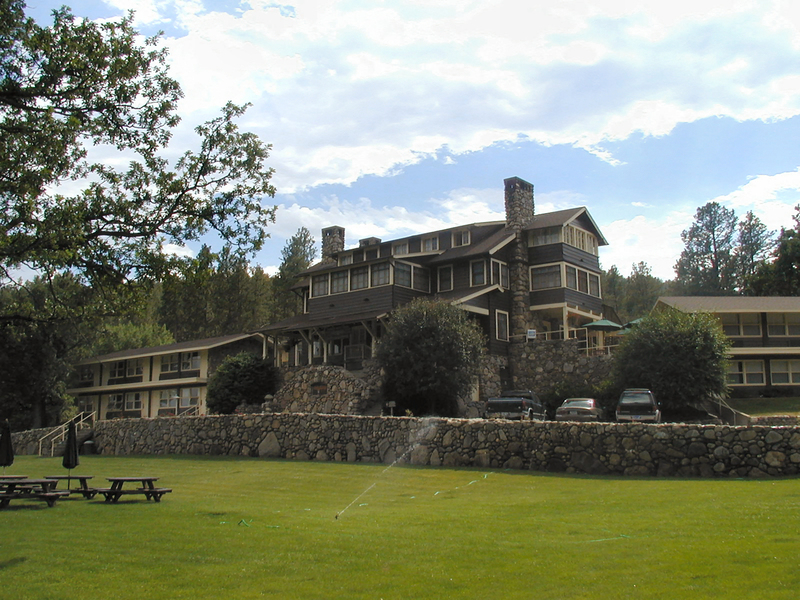 The State Game Lodge was designed by the same man who designed the Pigtail Bridges on Iron Mountain Road. My Historic Hotels & Lodges website has lots more Photos of the State Game Lodge, Custer State Park, South Dakota as well as a brief history. 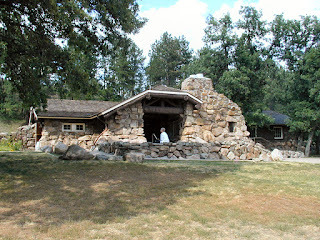 The historic Peter Norbeck Visitor Center in Custer State Park South Dakota. 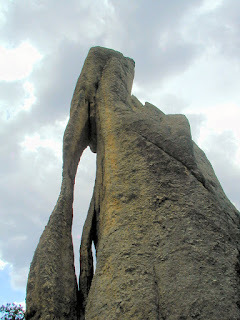 More rock formations at The Needles. The Needles Eye Tunnel with a car approaching. 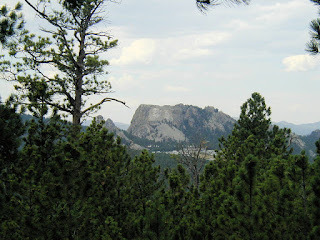 See my Stock Photos of Mount Rushmore National Memorial, South Dakota. It's right next to the places on this page. We hope you enjoyed these photos and that they help motivate you to get out and enjoy the beauty of God's creation!